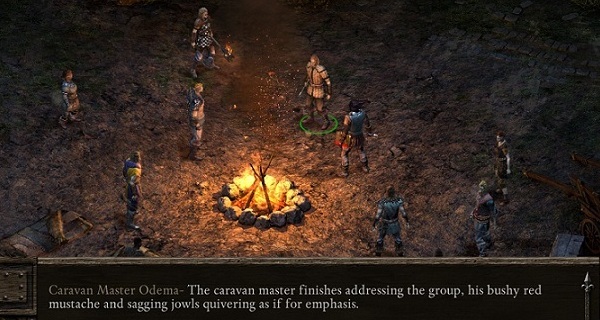 Pillars of Eternity is a difficult game to write a review for. 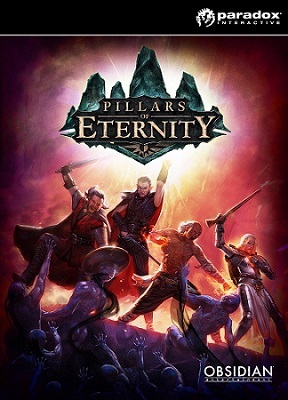 Not because it’s bad, but because there is just so much ground which needs to be tread when examining this title created by Obsidian Entertainment and published by Paradox Interactive. The game follows on in the vein of classic RPGs (which I very much love) and is made by the same studio which made Fallout: New Vegas, Wasteland 2, and South Park: The Stick of Truth. 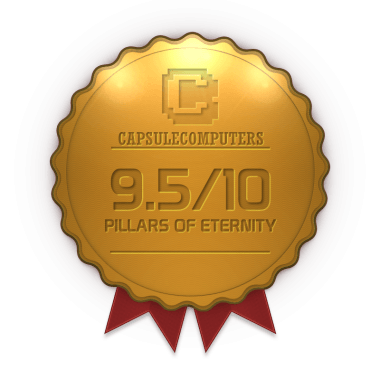 I saw that a lot of praise has been heaped onto this title by other, less-capsule-shaped publications. I am now able to say earnestly that this praise was well and truly earned. The story is fairly dense high fantasy faire, just the way we like it, as the player starts out as a traveller amongst a convoy of settlers, seeking to find land in a frontier village. A magical storm strikes and forces you take shelter in some nearby ruins where you come across a mysterious ritual being performed by shadowy figures. The magical storm strikes again at the climax of the ritual and awakens within you the ability to see souls (both living and dead) as what’s called a ‘Watcher’. The story unfolds from there as you explore the land of Dyrwood in the aftermath of a holy war, while a terrible affliction affects the land and causes children to be born without souls. As you search for a way to undo or come to terms with your condition, you will meet and unravel the many mysteries of this land. Along the way you’ll be encounter many interesting characters to join your party and at one point you actually end up with your very own keep to manage. I have not been able to get through all the story at time of writing (hell, I feel like I’ve barely even begun to scratch the surface), but suffice to say that I will certainly be coming back to see how the narrative arcs. The writing and prose are of an excellent quality which is very fortunate as there is so much of it which you’ll either read or have narrated to you. The mythos that’s created here is suitably rich and the game does a fairly good job of immersing you into its lore gently. It may still feel overwhelming to begin with, but after you’ve spent a good number of hours (and trust me, you’ll want to spend a LOT of hours here) you’ll be able to recognise and draw upon your own knowledge of places, politics, and pantheons. It’s clear that there is a strong influence from established fantasy universes (like Dungeons and Dragons) but the game avoids going into too many clichés of the fantasy genre. 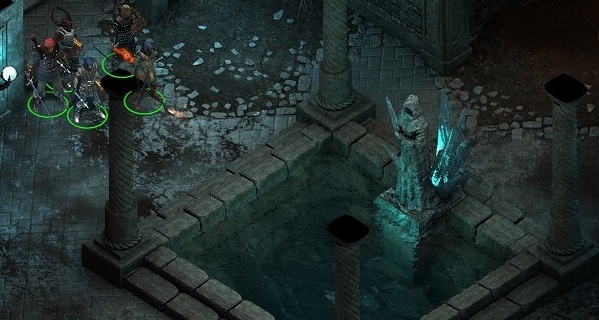 The game takes its cues from classic isometric RPG games like Baldur’s Gate and Planescape: Torment. The player can control up to 6 individual characters and move them around the map by clicking. The action takes place in real time but each character/monster has limited uses of their abilities and their actions requires a cooldown. Time can be paused and slowed as sped up to help you plan through fights. On harder difficulties planning, forethought, and meticulous execution becomes a necessity if you wish to take on more difficult opponents. 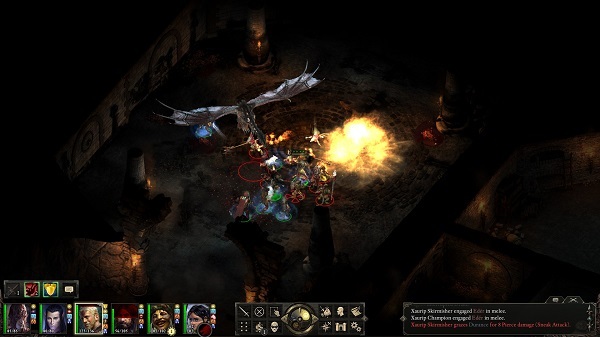 The combat is satisfying and tense and in this regard, the game has done the impossible for me and made the dungeon crawl (normally the most boring part of an RPG) into something dynamic, strategic, and fun. Each new engagement generally requires you to think about how you’re going to tackle the problem as well as managing the health of the party. Characters do not die when they lose all their stamina but instead are knocked out for the duration of the fight or until they are revived. What doesn’t replenish so easily is a party member’s health which steadily goes down in accordance with how much damage they take and is only replenished by resting at camp or in an inn. If they lose all their health, even if they’ve never been knocked out, they can become maimed or die. Feeding into this system are the stats, skills, and talents which you can customise for each character. There is a significant amount of depth here when it comes to customising your character (or just an insane amount of choice) and what you choose to specialise in can affect the role-playing elements of the game. Certain dialogue options becoming available due to a particular character having a particularly high stat or skill. The art design in the game is distinct, pleasant, and of a high quality. The designs of the environment help to make each zone its own entity (except for some areas which have are recycled from one level or another). 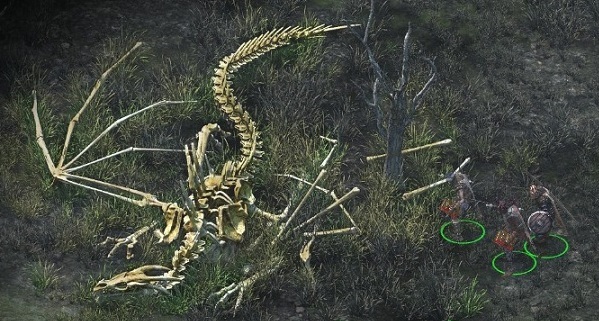 The character animations are also suitably well done with magic spells and prayers each getting what looks to be their own unique animation. 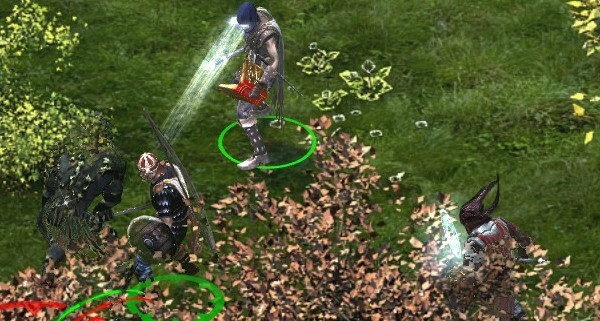 As pretty as the background is, it can at times become quite impractical as characters go (literally) behind the scenery and the player is unable to see the action. Luckily, these instances are few and far between however. The soundtrack in this title is of an exceptional quality. The tracks this game has to offer are a welcome companion when travelling across the fantasy wilderness or when fighting for your life in some gods-forsaken dungeon. The combat music in particular is particularly memorable and will now be stuck in my memory to be brought out when the situation calls for it. The voice acting is also quite good, but I do wish that there had been more of it implemented in the game as it appears to have been done in a patchwork manner. The game also features some enjoyable creator commentary by various members of the design team. It is quite enjoyable look behind the curtain in hearing their stories and learning the thinking that was put into specific points in the game. 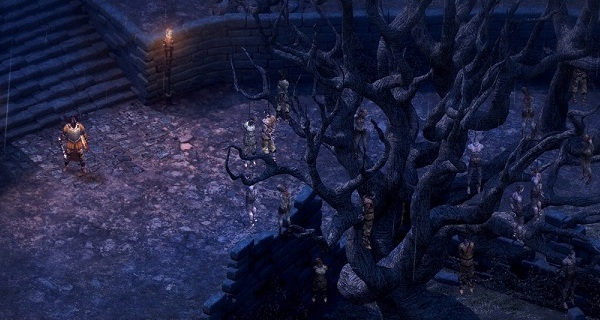 Pillars of Eternity is a fine example of a contemporary isometric RPG. 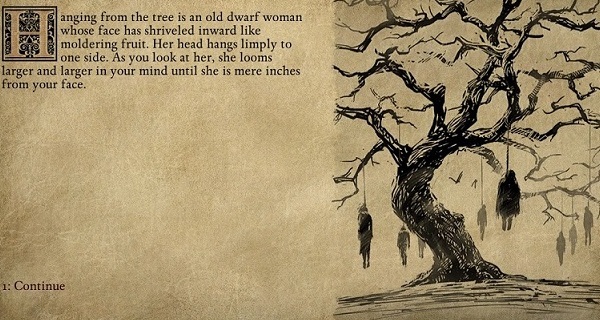 The story is engrossing, the visual and audio design are spot-on, and the gameplay is superb. This game is good. Damn good. Save for a couple of issues here and there, it is damn near perfect. Kudos to the folks at Obsidian Entertainment!